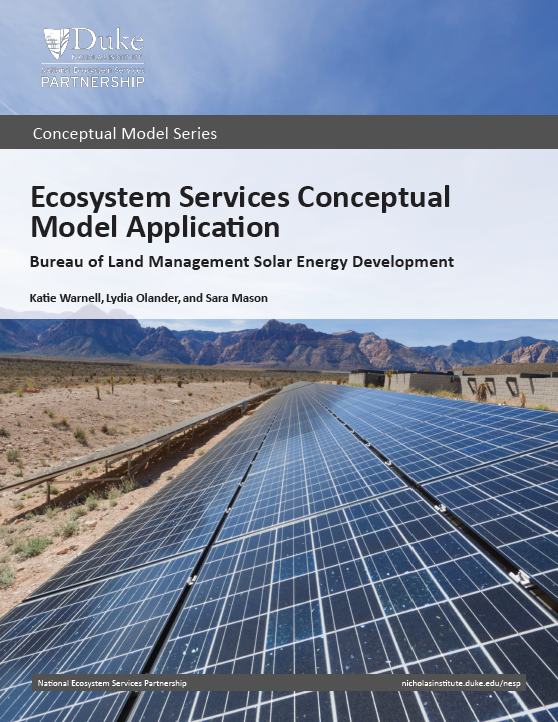 This report presents an ecosystem services conceptual model that captures the potential ecological and human well-being outcomes of the installation and operation of solar energy facilities on land managed by the Bureau of Land Management. An accompanying evidence library provides a summary of the currently available evidence for each relationship in the model and an assessment of the strength of that evidence. The model could improve and help to streamline the Bureau of Land Management's environmental assessments. The report is part of the Conceptual Model Series produced by the National Ecosystem Services Partnership. 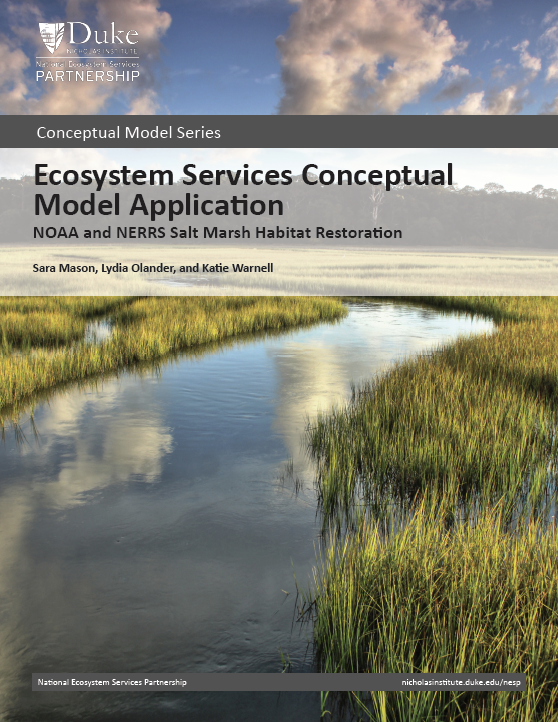 This case study, a companion to Ecosystem Services Conceptual Model Application: NOAA and NERRS Salt Marsh Habitat Restoration summarizes initial efforts to apply a general salt marsh ecosystem services conceptual model to specific sites. 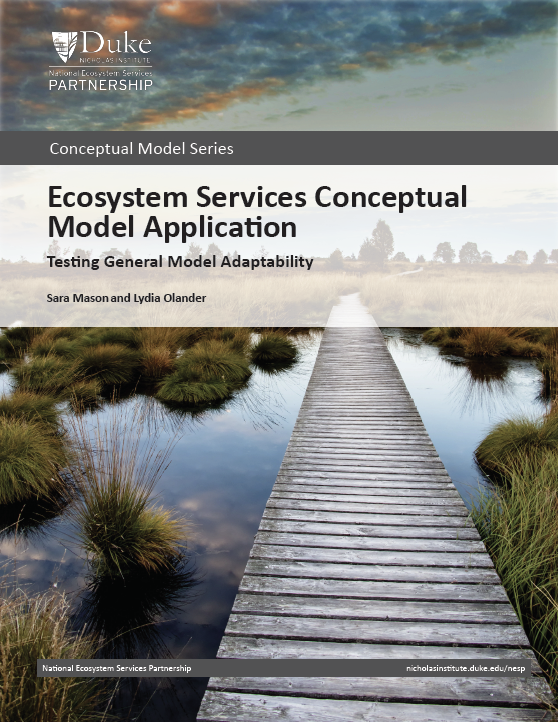 This case study discusses efforts to test whether a generalized model can be adapted to specific sites, noting considerations that arise and revisions that should be made to a general model applied to a particular site. This case study is part of the Conceptual Model Series produced by the National Ecosystem Services Partnership. 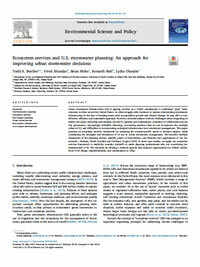 This report provides an illustrative ecosystem services conceptual model for salt marsh restoration at National Estuarine Research Reserve sites. The model captures the potential outcomes of a salt marsh habitat restoration. An accompanying evidence library provides a summary of the evidence for each relationship in the model and an assessment of the strength of that evidence. This report is part of the Conceptual Model Series produced by the National Ecosystem Services Partnership. 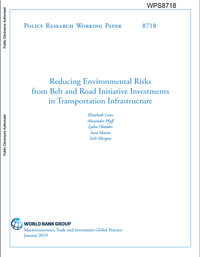 Funders and developers of infrastructure projects and businesses and managers overseeing critical natural resources are becoming increasingly aware of and interested in ecosystem services. Quick, simple, transparent, and low-cost ways for incorporating these services into decisions are just now under development. 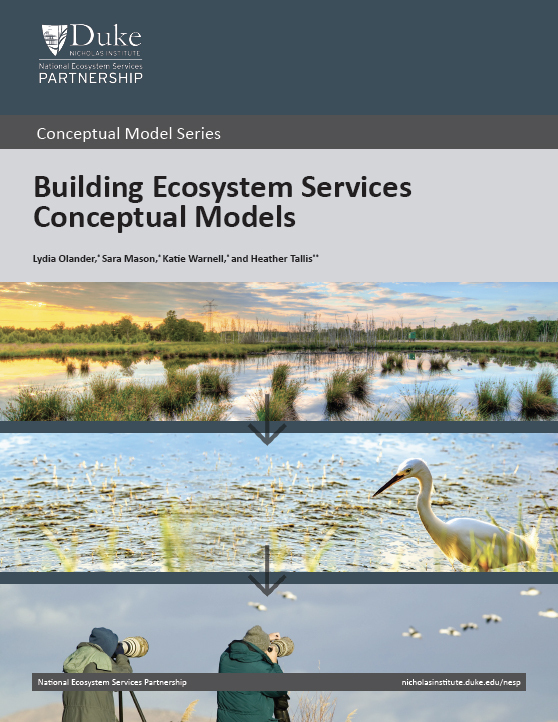 One tool that can support widespread implementation is ecosystem services conceptual models. This report facilitates development and use of such models in federal decision making by presenting a “how-to” guide and illustrative examples. It is part of the Conceptual Model Series produced by the National Ecosystem Services Partnership. To address limitations to stream and wetland restoration projects, there is a critical need for a functionally-based, high-resolution restoration priority system that can be implemented at broad spatial scales to maximize ecological benefits. 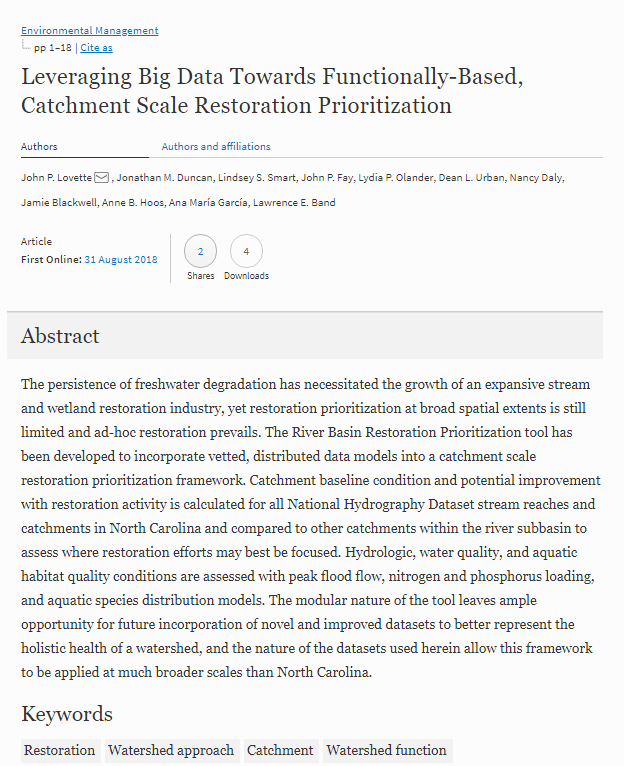 This article in the journal Environmental Management describes the River Basin Restoration Prioritization tool developed in conjunction with the North Carolina Department of Environmental Quality to incorporate data models into a catchment scale restoration prioritization framework. It is designed specifically as a state-wide screening tool that assesses hydrologic, water quality, and aquatic habitat quality conditions with peak flood flow, nitrogen and phosphorus loading, and aquatic species distribution models. Although the application of the tool in this analysis is for the state of North Carolina, the methodology and model datasets are readily applicable to other states or regions to assess a large volume of data to better inform restoration choices. 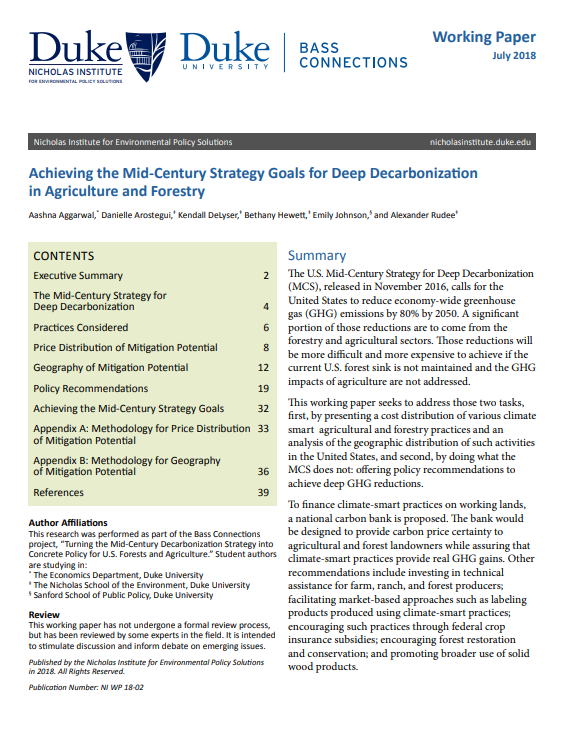 The U.S. Mid-Century Strategy for Deep Decarbonization, released in November 2016, calls for the United States to reduce economy-wide greenhouse gas emissions 80% by 2050. A significant portion of those reductions are to come from the forestry and agricultural sectors. Those reductions will be more difficult and more expensive to achieve if the current U.S. forest sink is not maintained and the greenhouse gas impacts of agriculture are not addressed. 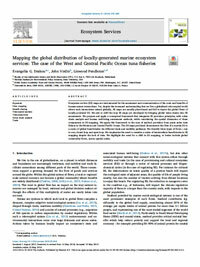 This working paper seeks to address those two tasks, first, by presenting a cost distribution of various climate-smart agricultural and forestry practices and an analysis of the geographic distribution of such activities in the United States, and second, by offering policy recommendations to achieve deep greenhouse gas reductions.